Google's Nearby API is one of the coolest things developers aren't using. I mean, they are, but not as often as I had hoped. Radon is a new sharing app based on Nearby, and it's pretty cool. Just share something to Radon, and it will search for target devices in close proximity with WiFi, Bluetooth, and ultrasonic pulses. The app ties directly into the system sharing menu, but it's not for file pushing. Radon is intended for links to web pages, videos, and so on. Simply share to Radon and your device will look for a connection using Nearby (you have to authorize this when the app is first opened). The other device does need to be running Radon for this to work, but there's no sign-in or account creation necessary, and it'll work fine on phones that lack NFC. 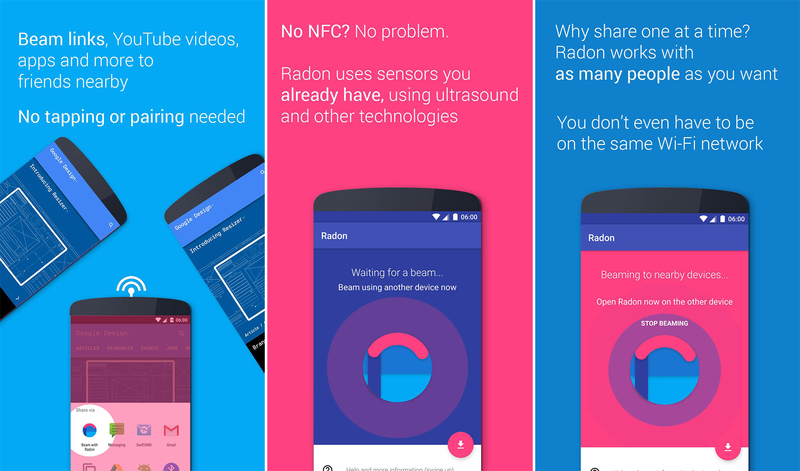 Radon is free in the Play Store, so it won't be too much of a hassle to get people to install it. There's a QR code and link in the app that can be given to others that helps them install Radon. It's not as convenient as having something built-in, but it does work well. Frankly, I don't know why Google hasn't made something like this a stock feature of Android.